Ground Floor Condo With Access To Private BBQ Patio And Lawn Area. This luxury ground floor private 1 bedroom retreat is located in the 5-star Grande Rockies Resort. The suite has a king size bed (with a cushy mattress pad!! ), fully equipped kitchen with granite counter tops and stainless steel appliances, gas fireplace, flat screen HDTV's both in living room and bedroom, wi-fi access. Outside on the deck/patio there is a grill, fire pit, and hammock and, because this condo is located on the first floor and in the corner, it feels very private and secluded and opens up nicely into a beautiful forest backed by mountains. The condo is fully stocked for all your self catering needs. 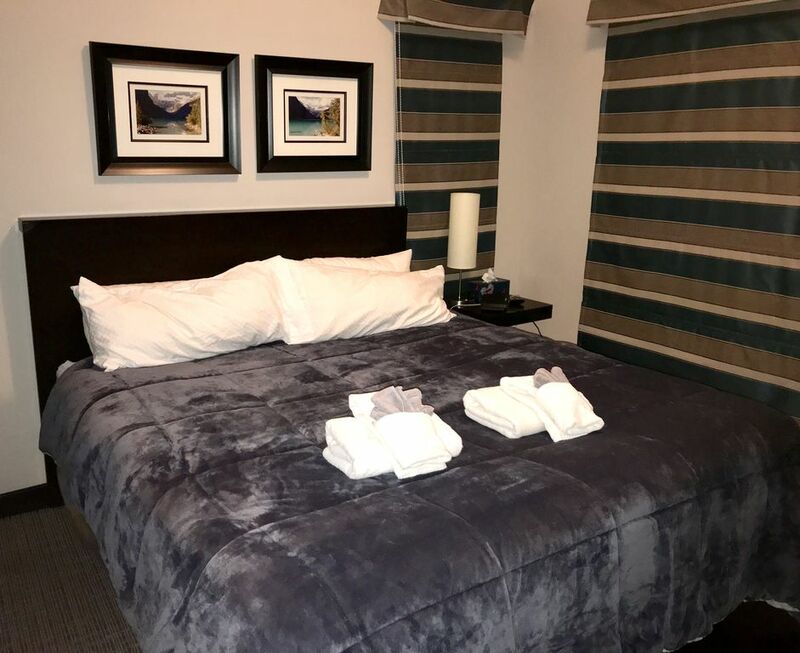 Please note that this condo does not have an in suite washer/dryer, there is a public laundromat located on Canmore Main Street less than 3 min drive away. Guests have access to all of the resort's amenities which include the indoor pool with waterslide and kiddie pool, indoor and outdoor hot tub, spa, fitness centre, lobby lounge and underground parking. The in-house Habitat restaurant is fantastic. The condo is just a 10 minute walk from town and takes you past Elevation Place, Canmore's newest fitness center, with a mountain climbing wall. In town you'll find dozens of restaurants, boutiques, coffee shops and spas. Whether you like indoor or outdoor sports, skiing, hiking, golfing, biking, or just a quiet walk along the river, Canmore has it all! Least important (hopefully): this condo has the hook-up with Netflix/Hulu/Amazon Prime/HBO Go and all other Apple TV perks. Most important: nearest Tim Horton's is only 1km away. I am a law student in Dallas, TX who would much prefer to not be a law student in Dallas, TX and instead spend as much time as possible in Canmore/Banff. I came to Canmore and Banff a couple of years ago and have not been able to stop coming back. I wanted my own place in the area so I could have a "good" excuse to return as often as possible. To be honest, most of the condos in the area are very similar—I believe this unit stands apart slightly among the rest as its on the first floor and in the corner and has a "porch" that opens up into the forest. Most places on here (of similar size and price) feel like hotel rooms, but given my condo's "unique" spot, it feels a little more secluded and private (and hopefully cozy). We had a great stay and this cozy condo had everything we needed. Clean and comfortable condo - good amenities - very good location - short walk to centre of Canmore - owner very responsive to enquires. Very impressed with this condo, clean & very comfortable. It was a great place to stay for our family vacation. Building was great - pool/hot tub were amazing. Gym in the building was a bit small & didn't open until 8:15am, but it did the job. Pullout bed in living room is best for kids. Kitchen had everything we needed (would suggest a few more dishes). Condo was on ground floor in the corner, so it was very quiet. Thanks for a great stay! We had a great stay in Canmore, the condo had everything we needed and was well maintained. We enjoyed the hot tub and pools at the resort. Would stay here again. Perfect - glad you enjoyed your stay! Great stay as always. This is our 8th time at this location and have never been disappointed by the supplies service or amenities. Thanks!